It so funny how when the holiday approaches, suddenly your have a hankering for all your favorite foods, and it is not only due to the taste, but somehow you are craving that feeling of home, that feeling of family. You all of sudden want pie everyday, collard greens from your from your favorite aunt, and macaroni and cheese from your momma. So just to indulge your impulses of needing home and home cooking you start to seek of out places that can potentially satisfy or at the least hold you over weeks or days before the big holiday. 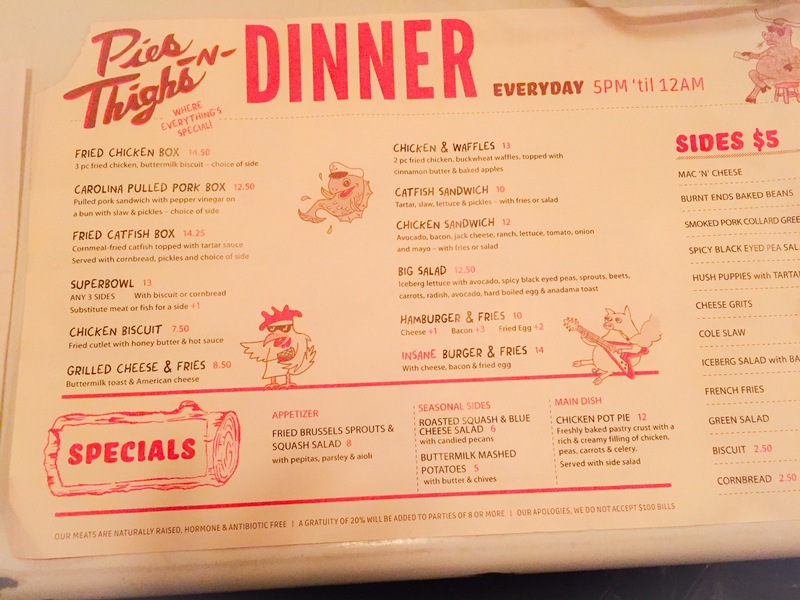 So I decided to check out Pies and Thighs in Brooklyn, New York. My first attempt to this restaurant met me with people outside waiting patiently in the cold, and tons of people on the inside, food looking absolutely scrumptious, but unfortunately I was unable to wait. Round 2, to the same location, but on a different day and different time, and was comforted by being able to get a table right away, good timing was all, we simply walked in as someone was walking out. No, Pies and Thighs does not take reservations only a name on a notepad upon arrival. 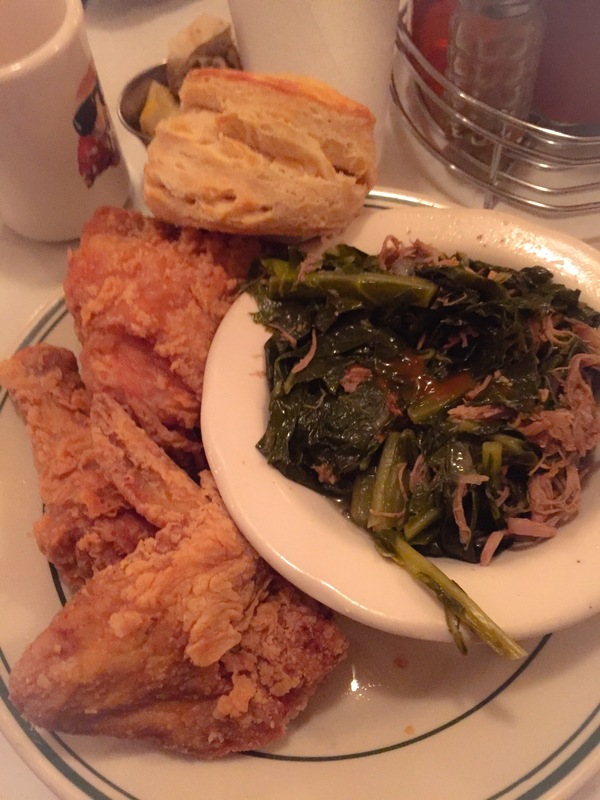 First item on the dinner table “chicken in a box” which consist of 3 pieces of chicken, one wing, one drumstick, & one breast, with a side of collards with shredded pork, and a side of cornbread. After a long, tedious, slightly inattentive wait, beautifully golden, super crispy fried chicken has finally graced me with its presence. Only it was the grace of God that I did not return the food, slam my fist on the table, and declare to the waitstaff that I had been hoodwinked, flimflammed even. Yes the chicken was piping hot, yes i heard myself crunch with my initial bite, but what I didn’t get was any flavor, sure it wasn’t detestable, and to be honest how often are any of us eating detestable food, but we are definitely eating fair food which is the complete antithesis to good and good being the enemy of best. Next up collard greens; it is my personal opinion that people who can cook delicious greens have been endowed with an annoiting from God, and upon first bite you will know if God has graced them or if they are working in their own strength. Well i have to write, own strength was working here, sure the greens was tender, not cut up in small enough pieces for my preference, but nonetheless cut up, spicy and vinegary. Although I realize that vinegar is a staple in most collard green recipes, i never expect the vinegar to be the prevailing taste, especially since you have the shredded pork inside of it. I mean where is the smokiness from the meat and where is the savory flavor, clearly absent. Fourth up, macaroni and cheese, made with cheese sauce, lightly seasoned, however, no texture, which homemade mac and cheese should always have a certain texture, just to convince you that you are not eating cheese from a can, and again not detestable, but definitely not delectable. Finally apple pie, simply because I felt remiss for trying the thigh or wing without the pie. The crust was flaky, buttery, and actually delightful. The filling appeared to made from scratch, cinnamon very evident throughout, but nutmeg seemed to be lacking, and we all know that it is nutmeg that brings an apple pie together. The apples weren’t tender enough, i am assuming that a baking apple wasn’t used, which isn’t a fatal flaw, but your cook time will increase tremendously. Needless to say I felt like I was eating pie from a local bakery other than eating pie from my kitchen which is exactly what I wanted to be tricked into thinking. So to sum it all up, I was deceived by Pies and Thighs, the people waiting outside, the long list of names waiting to enter was all a smokescreen. 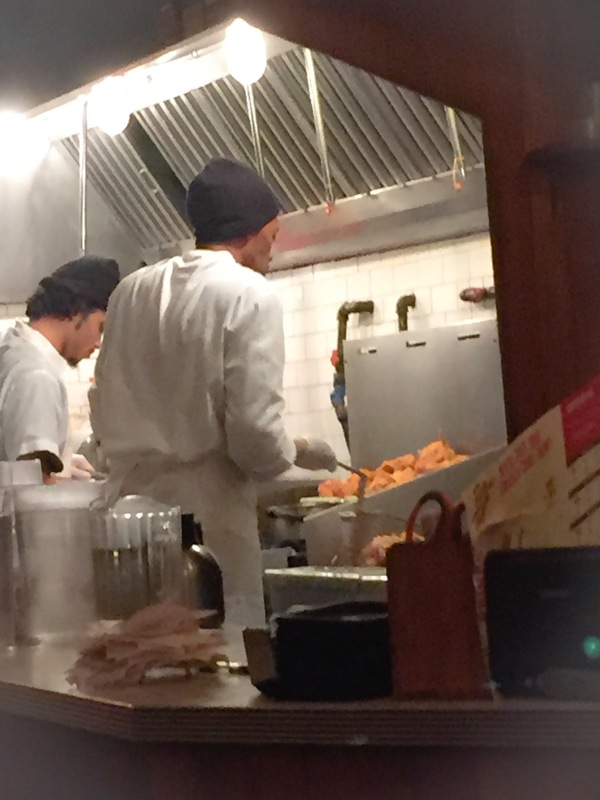 The small space has a gimmick, the service is slow, which keeps the people waiting and the perception of being the hottest chicken place in Brooklyn going. Sure the food looked comforting, but it did not give me the similitude of home, it did not comfort me or give me the prelude to Thanksgiving that my palate desired. The food was not horrible it was absolutely edible, I would even rank it fair on the food richter scale, but the truth is, who wants to go out to eat fair food, you wanna eat delectable amazing food, food that makes you smile, that encourages you to brag on them, food that makes you rave and return.